Looking for reviews from Disney Resorts? Check here. What’s vegan at the Disney World Resorts? Dinner Vegan Option: Buffet: Salads, Baked Potato. Chef TJ (is out until mid April) accommodates vegans with multiple courses: Tofu with grilled vegetables, Samosas, Soup, Salads, Nachos, Dessert. *Item may not be vegan. Vegetable burgers will often need swapped with a Gardenburger® Malibu Patty. Remember to always ask your server or a chef if the item is vegan. Disney World restaurants are constantly changing ingredients and suppliers. I just finished a fabulous meal at the Beach Club’s Cape May Cafe! My omnivore family booked the reservation months ago and after reading the horror stories online about their lack of vegan options I prepared for the worst. My fears quickly vanished after chef Seth visited the table to discuss my meal. He brought out a fresh salad, pesto veggie pasta dish, and tofu scramble. They were all delicious and I was very full when he brought out the mini cupcakes for dessert from Erin McKenna’s bakery in Disney Springs. PS: I took photos of each course that I’d like to share if you are interested. The chef at Art of Animation just told me that their pizza crusts have egg in them, I can’t imagine there is a different crust at Pop Century right next door. Crappy news at 2 minutes to midnight after racing here from Epcot. Ah no! They change suppliers so often that it’s hard to keep up. I hope they were able to make you something. We have experienced nothing but very accommodating attitudes when we ask about vegan options anywhere on Disney property. **Please do not** order the pizza option at All-Star Movies. We were super excited to order it once we found out they had it. It cost us about $24 which is expensive but I figured everything is here. When we got it it was literally 4 pieces of bread with vegan cheese and pico de gallo. Ummm no that doesn’t fly, I’ll be taking my $24 back thank you! WOW! I would be asking for a refund too. Did you get a photo? Fyi, the contemporary has vegan cheese available. To be specific, the contempo cafe has vegan cheese available for pizza. We even got a side of it to put on some pasta. The Sassagoula Floatworks and Food Factory – French Quarter has the Beyond Burger available upon request. They may say “veggie or vegan burger” but insist on the Beyond Burger, ask to speak to a chef if necessary. They also have vegan cheese to put on it. Kona Cafe and Kona Island no longer have the Rainbow Sushi, instead, they have the Vegetable Nigiri, just get it without the sauce. I had dinner at Trattoria Al Forno a few weeks ago and I was offered an off-menu vegan risotto instead of regular spaghetti and it was super creamy and delish! For desert, the Zepolli was also vegan and they brought out two completely vegan dipping sauces as well, a chocolate and a raspberry. I would highly recommend both dishes! Just ate breakfast at Boma. The server got one of the chefs for me, who pointed out the few things that were vegan on the buffet. Interestingly, the potatoes and plantains she said are fried with everything else, so they come into contact with meat :/ (I had been hoping to fill up on potatoes). Anyway, she made me vegan Mickey waffles and a really great scrambled tofu with spinach, mushrooms, diced peppers, etc, and also a bowl of pap (without butter) covered in chakalaka. She also brought me two vegan cookies, and two tiny vegan cupcakes. I was so full at the end of it – certainly worth the money. Real bummer about the potatoes though. We’re at the Boardwalk today, and the ESPN Club has a vegan Asian Stir Fry, you just have to get it without fried wonton strips. I’m curious to hear if anyone has tried Ohana for dinner? I’m supposed to go in June and honestly have NO IDEA what to expect. Just back from a great trip to the World. I’ve posted about great meals I had in December, but we tried some new places this time, and I’m posting reviews for all of them. This is for Olivia’s at Old Key West. If you take the boat from Disney Springs to OKW, it lets you off right at Olivia’s. My husband and I walked over from Saratoga Springs, where we were staying, and decided to stay at OKW for lunch. The veggie burger (and bun) were vegan (I had them check), and it was really really good. Served with avocado and some other items–a great big satisfying meal. They also made me a lovely vegan salad. I don’t know about dessert, because we were both too full for any more food! You might need a reservation there, but the day we had lunch, the place was pretty empty, so no reservation was necessary. The hostess did tell me that you must have a reservation for breakfast, though. We had dinner in May 2016 at the Rose and Crown at Epcot and the waitress and chef were super helpful. They made us a delicious vegan curry, and a special vegan desert. Made the night! We also had lunch at Chef De France, in 2015 the chef came out and made us a special vegan meal that was AMAZING! and they offer sorbet for desert with berries. In 2016, the new chef seemed to be having a really bad day, as the waiter didn’t want to go and talk to the chef and offered different options on how they could change stuff on the menu. So we had the vegetarian lasagna without cheese. The noodles weren’t vegan but the veggies were soo good and l didn’t get ill from the pasta which has happened to me before at Tony’s Town Square. Speaking of, worst experience, Tony’s Town Square. I’ve tried there a couple of times because l thought maybe it was just an off day and l’d give them another chance but the last time was the worst. Everyone in the party had dietary needs. So we told the waiter and the chef actually refused to come out, (we felt bad for the waiter). They put seeds in the salad even though we said one person couldn’t eat seeds. Then we just got pasta with marinara sauce, before l was even half way through my stomach started to get upset. I was then in the washroom for 40min, it then cascaded through the party with each of us spending time in the washroom taking a good hour and a half out of our evening. After l returned to the table, we informed the waiter that we were all taking ill. He just said oh sorry, and we were charged full price for the meal. Sorry Tony’s but never again! Animal Kingdom breakfast buffet at Boma was really good. The chef came out and took us around to show us what we could and couldn’t eat, they then made us a a huge plate of tofu scrambled with veggies that they brought to the table, it was soo good! Just back from a great December trip. AKL: (1) Had breakfast at the Mara every morning. The steel-cut oatmeal is wonderful, and the vegan waffles are excellent. The allergy chefs were all awesome, as is the entire staff there. (2) The Mara also made me a special vegan flatbread sort of thing for lunch one day. Absolutely excellent! (3) Picked up the vegan menu at Jiko, since it changes all the time. There were zero vegan appetizers and the entrees didn’t interest me enough to go there. (4) No vegan menu anymore at Sanaa, and I suspect the only vegan food there is quite spicy. Not to my taste. Passed on that, even though I love the venue. GF: We had lunch at the Grand Floridian Cafe–just walked up and got seated almost immediately. Our server’s (Goldie’s) daughter is vegan, and she knew exactly what to suggest–the salmon dish, only with tofu instead. Yes, they’ll make it for lunch as well as dinner. To say that it was delicious is really not enough. It was awesome. My sister and I both cleaned our plates and decided immediately that we’d have to go back at least once during the trip, which we did, and had the same dish for dinner one night. Two different chefs, slightly different versions, but both excellent. The night we had dinner there, the chef also made sure to serve us vegan rolls and a vegan spread that really tasted so much like butter I was a bit hesitant to eat it! Kudos to the Grand Floridian Cafe, the servers and chefs alike! FYI. as of December 2016 Jiko has a combined vegan/vegetarian menu. 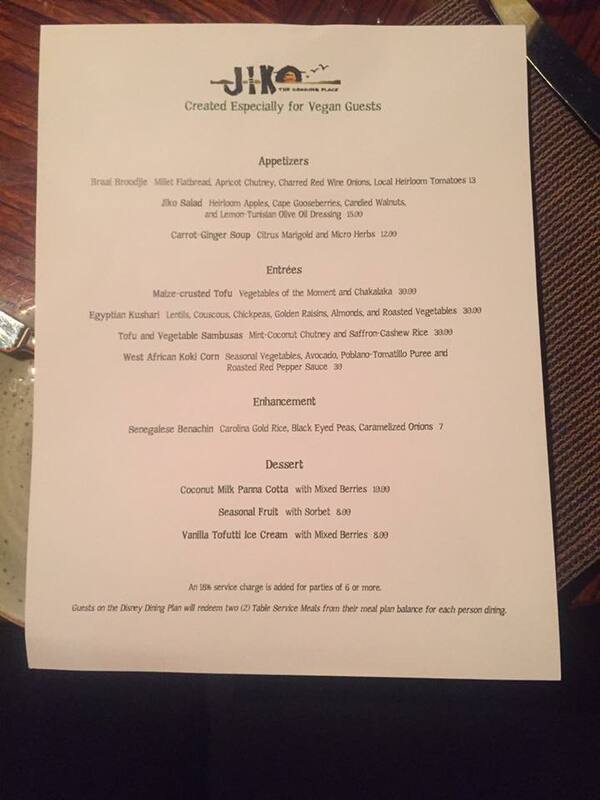 None of the appetizers are marked vegan, but they said a couple could be modified for vegans. Two of three entrees were vegan as is, and the tofu dosh could be made vegan. There’s an enhancement (Senegalese Benachin) which is marked vegetarian but the chef said it’s vegan. Thanks for the update! We’ll update the page accordingly. Is the Nann at Sanna have any vegan variations? Was just at Artist Point for my birthday dinner. I told them I’m vegan in advance but still have a pretty awful experience. They gave me a salad with no dressing (just lettuce and tomatoes, dry) and the eggplant felt like they had just taken the dish and whatever wasn’t vegan, they just removed. Super dry and bland. Sounds like an off day, the chef there is typically very vegan friendly. Sorry about your bad experience. I hope your birthday turns around. I’ve never had a good experience at the Artist Point, but the Roaring Fork at the wilderness was super nice and helped a lot. They made us a black bean burger, and asked how many and what meals we would be eating with them so they could arrange stuff for when we came. Not sure if the new restaurant offers the same. My family stayed at the Floridian and stopped at the Grand Floridian cafe for dinner. We looked for the vegetarian melange after seeing it on this list, but it wasn’t on the menu. However, our server heard we were vegan and brought out chef Nick, a terribly nice guy, who offered to revise their miso glazed salmon dish for us by replacing the salmon with tofu. It was excellent, would 100% have it again!!!! Thank you for the update! We’ll take that off. I had a great burger at All Star Sports, but when I asked at the dessert counter about a vegan milkshake, no one knew what I was talking about. I finally had a vegan waffle at Trattoria Al Forno, which I’m sure is the same vegan waffle they serve everywhere. I was really disappointed with the flavor and texture. It was more like tempura than a waffle. I don’t plan on ever ordering one again unless I can be convinced this was an outlier. That is definitely not how they are elsewhere. I’d give them another shot, those sound awful. Well you were right. I had waffles again at All Star Sports, and they were fantastic.